This name recorded as Ambrose and Ambrus, derives from the ancient Greek personal name Ambrosios meaning "divine" or "immortal". Its popularity as a medieval christian name was largely due to the fame of saint Ambrose (circa 340-394), Bishop of Milan and one of the great fathers of the Latin Church. His pupil was St. Augustine, the name is recorded in the Domesday Book of 1086, and again in the 1168 "Pipe Rolls of Norfolk". The surname first appears in the latter half of the 13th Century, (see below). In 1567, Johane Ambrose, daughter of William Ambrose was christened in St. James's Church, Clerkenwell. Isac Ambrose (1604-1663) educated at Oxford in 1624 was appointed one of the King's four preachers in Lancashire in 1631 and worked for the establishment of Presbyterianism. In 1729 Joseph Mottram and Ambrosia Ambrose were married in St. George's Hanover Square, London. John Ambrose (died 1771) was a captain in the navy who served in the Channel and Mediterranean between, 1734 - 1744 and rose to the rank of rear admiral. 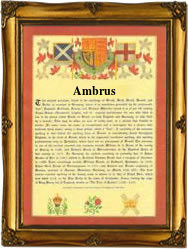 The first recorded spelling of the family name is shown to be that of William Ambroys, which was dated 1273, in the "Hundred Rolls of Bedfordshire", during the reign of King Edward 1, known as "The Hammer of the Scots", 1272 - 1302. Surnames became necessary when governments introduced personal taxation. In England this was known as Poll Tax. Throughout the centuries, surnames in every country have continued to "develop" often leading to astonishing variants of the original spelling.